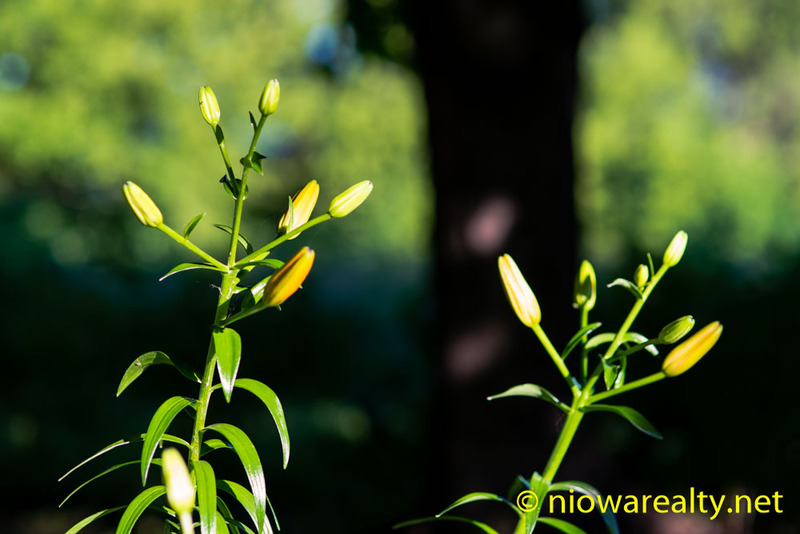 Share the post "The Time of the Lilies"
When driving past the Winnebago River this morning, I did notice some areas where the water was over its banks. There are two things about that river I don’t like of which I’ve mentioned before, and they are: the dirtiness of the water and the wildness of the flow. It’s not surprising there’ve been as many drownings in it over these long years of record keeping. I know there was more than one drowning at the dam that used to be near the bridge that crosses the Winnebago north of our City in the vicinity of the Crystal Sugar plant. When the water was flowing quickly, that dam made it all the more dangerous if anyone that wasn’t a good enough swimmer to get away from the undertow of the water spilling over it. I’m not sure which public entity decided it was time to remove that hazardous dam, but it did finally go. Hopefully, I made my last trip up to Forest City later this afternoon for a final walk-thru on a closing coming up the end of this week. I made sure to take my time getting up there so to be more aware of sights along the way. I’m actually glad I wasn’t driving so fast and was alert enough to bring my car to a near stop on B20 to keep from hitting a deer that came up out of a ditch like it was being pursued by something. The way it looked at me and braced itself, I actually believe it thought it was going to die. The reason B20 is such a bad stretch for deer is because of all those trees growing all the way down to the Winnebago River that gives them more than enough acreage to hide and multiply un-noticed. Speaking of deer. I had a delightful chat with a gentleman who’s one of the butchers at Fareway over the lunch hour. I asked about a certain ring bologna that’s supposed to be really good that’s made at a specialty locker over in Protivin which is a little over an hour drive east of us. He said they started carrying it while coming around the counter to show me where it was. I looked at the ingredients and one of them was monosodium glutamate which when reading, I quickly back away. MSG hates me. We talked about the locker as well as the deer meat that people take there to get processed. Since finding he’s a deer hunter I said, “You actually like deer meat?” He smirked while replying, “I can’t eat it straight, but I do eat it when mixed with other meats.” I smiled and said, “Well at least you admit you can’t, like me get around that gamey taste.” While walking away I thought him to be one of the more helpful of butchers I’ve encountered of late. If the population of the deer in North Iowa and Southern Minnesota continue to climb, I would strongly encourage a specialty slaughter house to be built here just for processing them. Maybe then there’d be more people actively hunting deer in knowing they can have their venison processed right here in River City. It’s certainly something to think about. When driving back from Forest City with the sun to my back, the fields and pastures were almost a florescent green. I’m a bit envious of that area because of its rolling hills with more native trees growing on hilltops and dales. It absolutely amazes me how many very expensive homesites have been built in that area. I wouldn’t be surprised if some of them cost well over $350,000 to build. I smiled while taking a photo in Forest City of my favorite summer flowers. Yes, we are now entering the time of the lilies.